Nectar of Non-Dual Truth, A Journal of Universal Religious and Philosophical Teachings is an annual publication that contains articles on the philosophy and spirituality of Vedanta and other religious traditions by authentic practitioners. 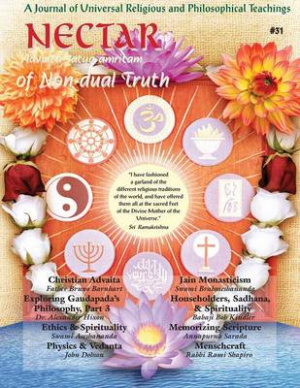 This issue contains articles on Advaita Vedanta, Nondual Christianity, Zen Buddhism, Physics & Vedanta, and selected spiritual practices of Vedanta, Jainism, and Judaism. Nectar #31 features articles by: Babaji Bob Kindler, Rabbi Rami Shapiro, John Dobson, Swami Aseshananda, Swami Brahmeshananda,and Annapurna Sarada. Nectar of Non-Dual Truth #31 by Babaji Bob Kindler; Bruno Barnhart; Rami Shapiro was published by SRV Associations in February 2016. The ISBN for Nectar of Non-Dual Truth #31 is 9781891893223. Be the first to review Nectar of Non-Dual Truth #31! Got a question? No problem! Just click here to ask us about Nectar of Non-Dual Truth #31.